These are two of my favorite picture books, and were so popular with the elementary kids at my school. I think everyone loves the idea of crayons having their own personalities that go along with (or clash with!) their color. 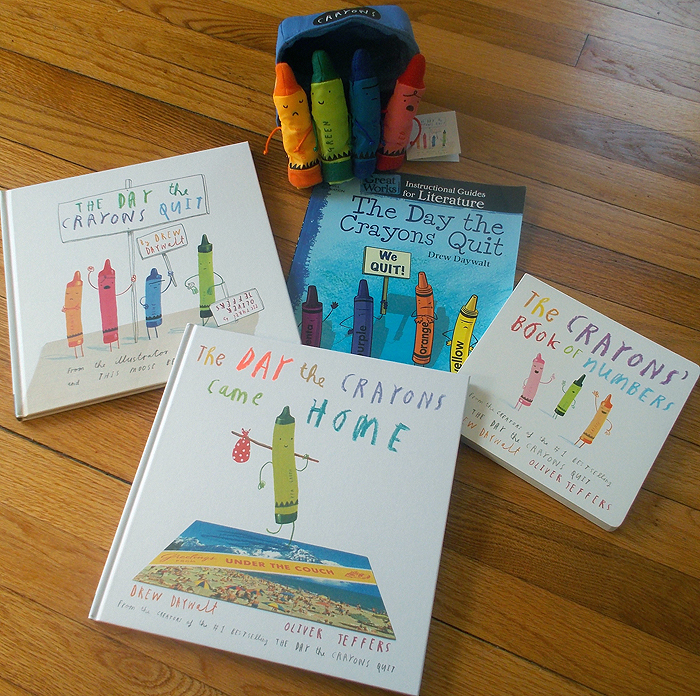 I've shared booklove for these before: I read both books at a storytime for adults with disabilities, and The Day the Crayons Came Home was one of my favorite picture books of 2015. 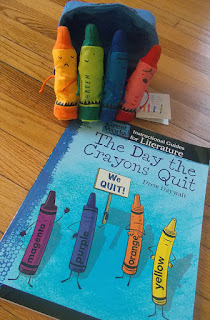 When I saw these cute finger puppets from MerryMakers, I knew it was time to revisit these books! I love how innovative the storytelling is - the crayons speak out about being misused, neglected, and overused in The Day the Crayons Quit, and in The Day the Crayons Came Home, misplaced and forgotten crayons send funny "Wish You Were Here"-type postcards to their owner, inspiring him to find them under the rug, in the couch, and more. In addition to the two classic (it's not too soon for them to be classics, right?) picture books, there are board books starring these famous crayons sounding off on colors and numbers. We love the number book because my son is starting to identify written numbers, and this book allows us to explore them in different ways. The number is written at the bottom of each page, next to crayons your kid can count. As each crayon is found, the number is spelled out. 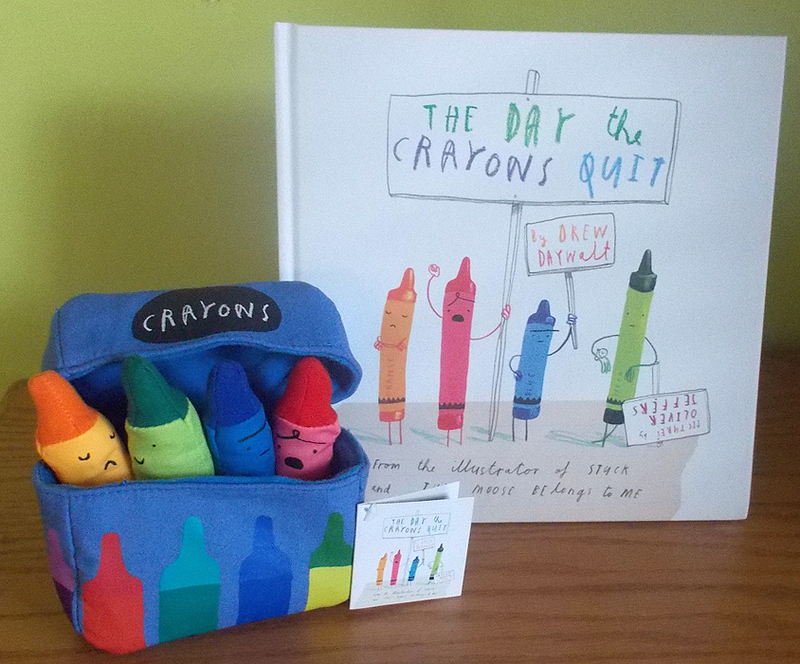 I love that it is written both ways, so your child can keep track of the crayons as you turn pages, and/or count the crayons at the bottom of each page. I even found an instructional book that is a wonderful resource for expanding these books into a lesson. There are vocabulary lists and reading response pages for older children, and pages that help children identify emotions (theirs and the crayons!) and animal colors for younger kids. That's not even scratching the surface of what this book offers - I highly recommend it if you're interested in exploring this book with your kids, students, or plan to adapt some activities for a storytime audience. Have you read these engaging books? Do you have a favorite book? 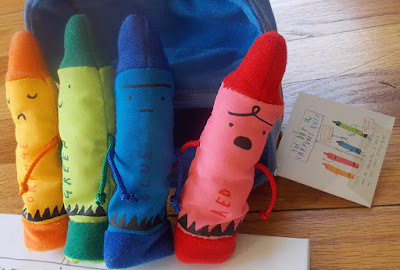 Do you have a favorite crayon?! Share your thoughts and activity ideas in the comments!